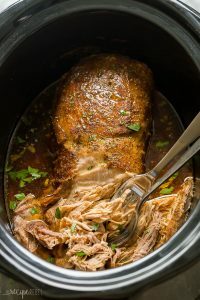 This easy Slow Cooker Pork Loin recipe includes a flavorful garlic herb rub, and is slow cooker in apple juice for extra flavor! It is fall apart tender with minimal effort! I know. It seems kind of boring. 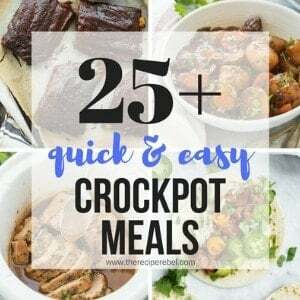 But I’ve been making this slow cooker pork loin at least once a month for a year or two. And it’s so good, and so tender. Plus, I’ve finally got my dry rub down and ready to share! It’s similar to my dry rub on this Slow Cooker Pork Tenderloin, but there’s so much more area to cover when you’re making a pork loin. I love to pick up a couple boneless pork loins when they go on sale and stash them in the freezer for those weeks I need an easy, hearty meal with minimal effort. You can really just throw the pork loin in the crockpot with some water and salt and pepper and it will come out just fine, especially considering you only spent about 2 minutes getting it ready. But if you want to take it up a notch? You’ve got to try this dry rub for pork. It would be so easy to make a big batch and store in an old spice jar to make the prep for this pork loin even simpler. 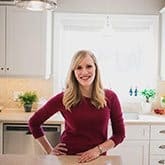 But even if you don’t, it’s still only going to take about 5-10 minutes of your time in the morning and you’ll have easy meals for the rest of the week! My average pork loin is about 5 lbs, so there’s lots to go around and it freezer perfectly, too! 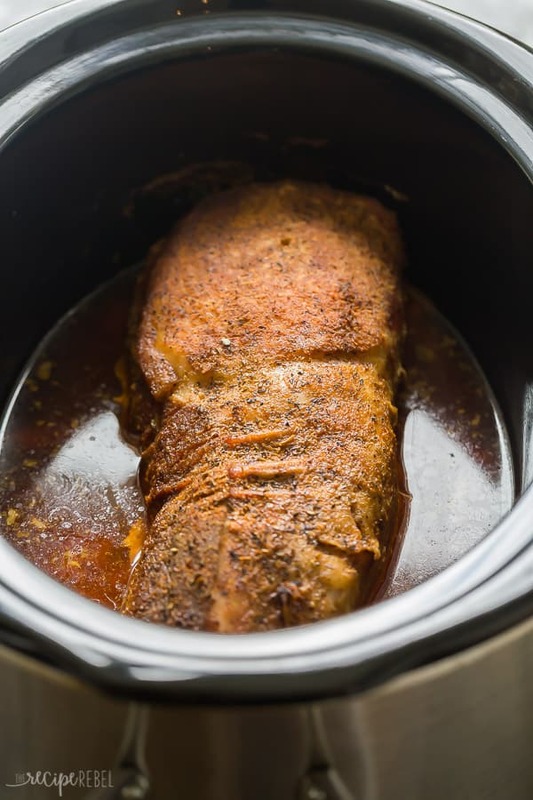 Since my Slow Cooker Pork Tenderloin and Instant Pot Pork Tenderloin have been so popular, I’ve gotten a lot of questions or comments about cooking pork loin. A pork tenderloin is much smaller than pork loin, it usually weights around 1-1.5 lbs, whereas the pork loin I used for this recipe was 5 lbs. You can see why the recipes can’t be used interchangeably — pork loin requires much more seasoning and much more cook time. You can read more about the differences between pork loin and pork tenderloin here. Low and slow. Although you can cook a pork loin on high in the slow cooker, I definitely prefer low heat for a longer period of time. It breaks down the meat until it easily falls apart! Season well. The pork loin is a large cut of meat, so I like to give it a solid coating of the dry rub before cooking. It can soak up a ton of flavor! Fresh or frozen. If you want something that cooks over a longer period of time, try putting the pork loin in frozen. If you want the rub to adhere to the meat, you will need to let it thaw at room temperature for an hour or two so the outer layer has thawed. Season and cook for 9-10 hours on low (up to 11 is fine — it won’t hurt it!). One of the reasons I love this Slow Cooker Pork Loin is because it shreds so easily, and there are a ton of ways to reinvent leftover pulled pork. Freeze it! Leftover cooked, shredded pork can be frozen plain or in barbecue sauce. It will keep for up to 3 months. As a pizza topping for regular or mini naan pizzas. Make a pulled pork grilled cheese. Top a salad with it. And on and on and on the list goes. What are your favorite things to do with it? Trim fat off around pork loin if desired. Combine seasoning salt (if you are reducing your salt intake, use only 1 tablespoon), garlic powder, Italian seasoning, mustard, onion powder and pepper. Rub all over pork loin. Place pork loin in 4-6 quart slow cooker and add apple juice. Cover and cook on low for 8 hours (or high for 4 hours). *See notes below to cook from frozen. 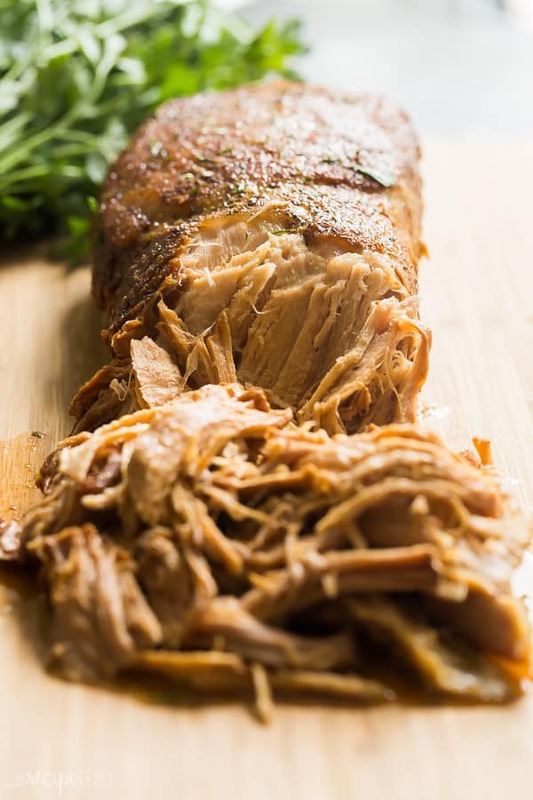 Shred pork or remove from slow cooker and cool for 15-20 minutes to slice. Optional: add barbecue sauce or other sauces and serve as desired. If you want something that cooks over a longer period of time, try putting the pork loin in frozen. If you want the rub to adhere to the meat, you will need to let it thaw at room temperature for an hour or two so the outer layer has thawed. Season and cook for 10 hours on low (up to 11 is fine -- it won't hurt it!). « Ricotta Stuffed Shells Recipe – make ahead and freezer friendly! I use pineapple juice with pork tenderloin and sometimes use apple slices, too. Any reason to drain the fluids after slow cooking the pork loin, before adding bbq sauce? Just so the flavor of the sauce isn’t diluted, but you can definitely save the juices! What if you don’t have the dried mustard? Could you use something else in place of that? Can I use apple sauce instead apple juice? And maybe add a little water? I probably wouldn’t use applesauce but chicken or vegetable broth would work just fine! Only 1 cup of juice? No other liquids? I’m going to try this one. I have everything but the apple juice ? is there an alternative? Yes, you can definitely use chicken broth instead! I used grape juice. We’ll see how that goes, lol! I love delicious easy pork dinners, and this one is a star! Love the flavors and SO easy! YUM!! 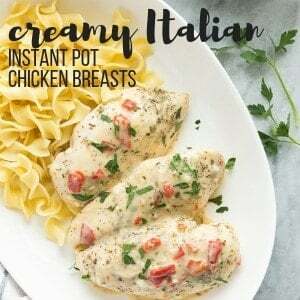 I can’t wait to make this for dinner next week! This looks so juicy and delicious! 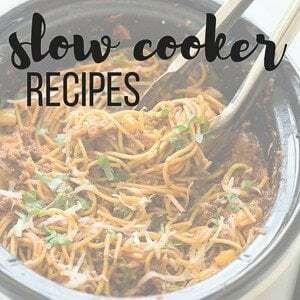 Love a good slow cooker recipe. Yum! Looks so flavorful and delicious! Well this is amazing! I was just looking for a new way to cook my pork loin and I’m definitely trying this one! I’m looking for the dry rub recipe for the pork tenderloin? What kind of “seasoning salt” do you recommend? Thank you. I use Lawry’s — it’s what I’ve used forever!